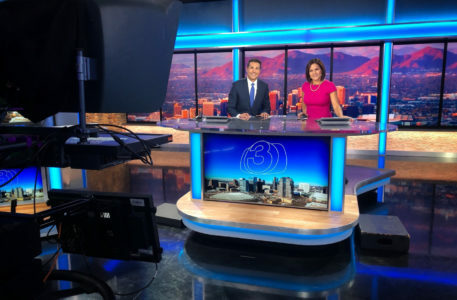 An independent station in Phoenix, Arizona, which serves as a sister station to the market’s CBS affiliate, has debuted a complete makeover of its broadcast design. 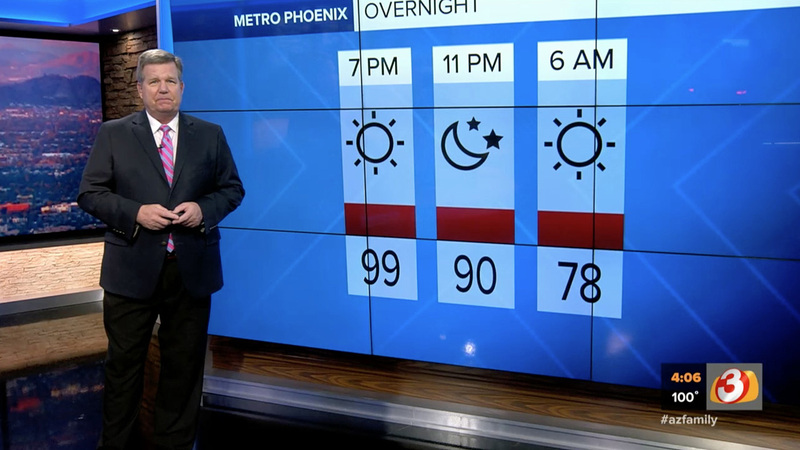 Meredith’s KTVK, branded as “3TV, Arizona’s Family,” unveiled its new look Tuesday, May 29, 2018. 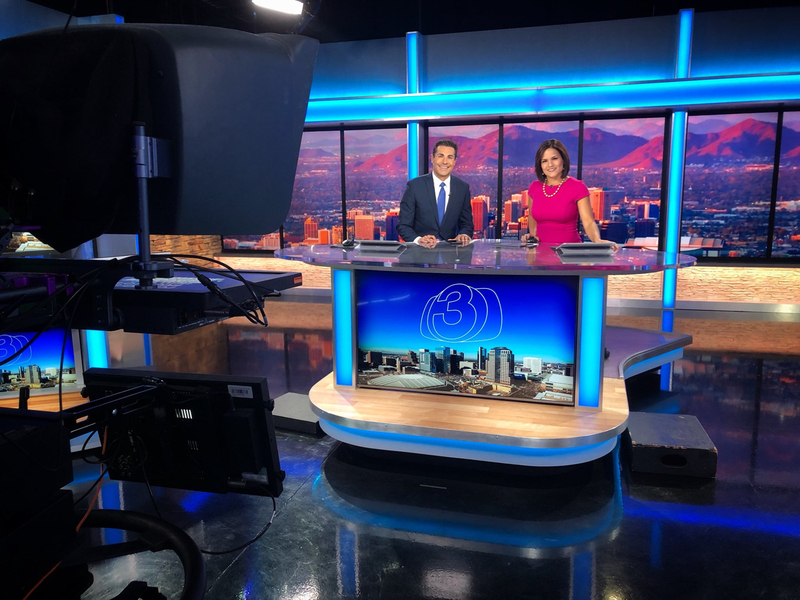 Its sister station, KPHO, got a new set last May. Both sets are from Z Space Creative with fabrication by Southwest Scenic Group. 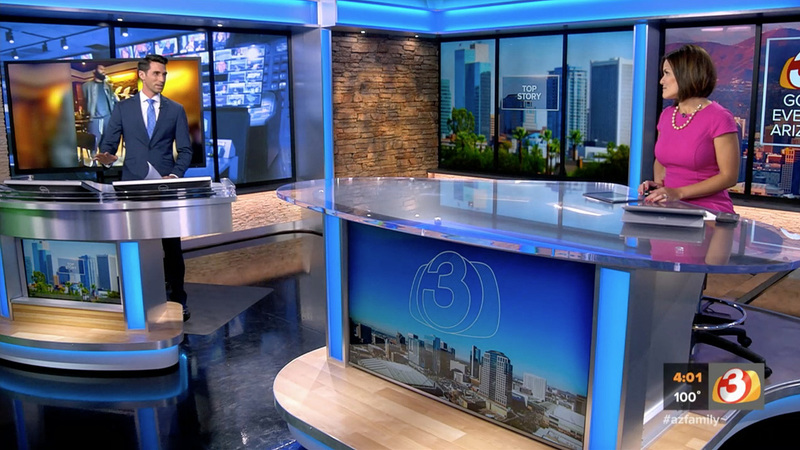 KTVK’s new home features a compact anchor desk fronted with a video panel and backgrounded by nine vertically mounted panels in three groupings that create the look of a wall of faux windows — though the station also feeds topical and branded imagery to the wall of panels. Camera right of home base features two additional video arrays: one a 3×3 design for use as both a standup and weather venue and the other a four-panel vertically mounted array. These two installations are backed with a wood toned wall featuring horizontal backlit bands. The walls then transition to curved ones with faux stone work and another trio of vertically mounted panels. In addition, backlit panels with arched tops serve as the backdrop for an additional three vertical panels that are spaced out and framed with a brushed aluminum lining, as opposed to forming a continuous array. On the other side of the anchor desk is a small, multipurpose standup pod situated in a corner created with faux stacked stone and three additional panels set into the wall and framed by dramatically lit columns, which are also used in the set’s main video wall and header elements. Eric Haugen of Z Space Creative handled lighting for the set with technology integration by the station group. 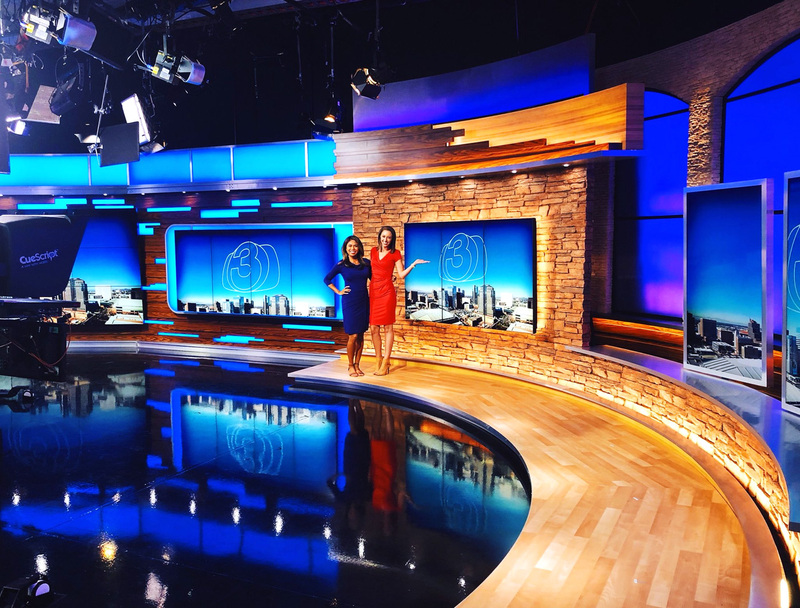 In addition to the new set, the station also unveiled a new graphics package that uses rectangular outlines to frame both the station logo and text.